ZF has introduced a reference design for an energy harvesting Bluetooth low energy switch in partnership with ON Semiconductor. The design combines ZF’s energy harvesting generator with the industry’s lowest power Bluetooth 5 radio RSL10 SIP from ON Semiconductor and is a solution for the rapidly growing number of applications for BLE communication. 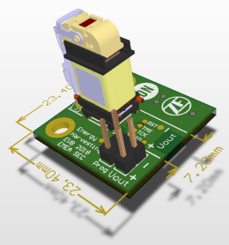 The generator, incorporated with the RSL10 SIP, enables designers to develop bespoke battery-free and wireless control solutions for a wide range of low cost, low-energy applications. The transmitter is designed for evaluation. For integration into an application, the PCB wings can be cut to size. The reference design works in Advertising Mode with uni-directional uplink communication and offers various pairing options. The operation can be shown via a smartphone app (IOS Bluetooth Smart Scanner and Android, Bluetooth Low Energy Analyser) which displays all received information. A supporting demo kit based on the reference design for the energy harvesting Bluetooth low energy switch, and ON Semiconductor’s Bluetooth IoT Development Kit (B-IDK) is also available from ON Semiconductor. The kit shows the capabilities of the battery-free and wireless switch in combination with an LED lighting application.